Apple® today (03/09/15) unveiled the all-new MacBook®, a new line of notebooks reinvented in every way to deliver the thinnest and lightest Macs ever. 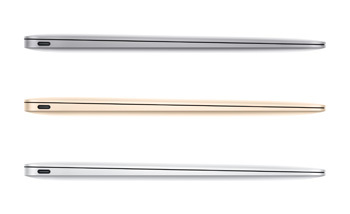 Every component of the new MacBook has been meticulously redesigned to create a Mac® that weighs just two pounds and is 13.1 mm thin. The new MacBook features a stunning 12-inch Retina® display that is the thinnest ever on a Mac, an Apple-designed full-size keyboard which is dramatically thinner and highly responsive, the all-new Force Touch trackpad that brings a new dimension of interactivity to the Mac, an incredibly compact USB-C port for data transfer, video out and charging in a single connector, and a new battery design that maximizes every millimeter of space to deliver all-day battery life. 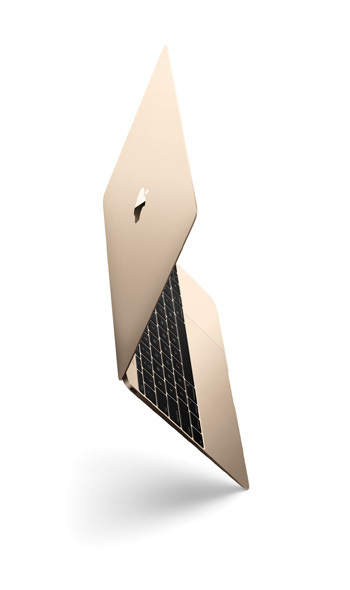 And, for the first time, MacBook is available in three gorgeous aluminum finishes—gold, silver and space gray. MacBook comes with a 1.1 GHz dual-core Intel Core M processor with Turbo Boost speeds up to 2.4 GHz, 8GB of memory, 256GB of flash storage and Intel HD Graphics 5300 starting at $1,299 (US); and with a 1.2 GHz dual-core Intel Core M processor with Turbo Boost speeds up to 2.6GHz, 8GB of memory, 512GB of flash storage and Intel HD Graphics 5300 starting at $1,599 (US). Additional technical specifications, configure-to-order options and accessories are available online at www.apple.com/macbook.